Nutanix Shadow Clones are a unique feature of the Nutanix Virtual Computing Platform that allows for distributed caching of virtual disks across different Nutanix nodes. 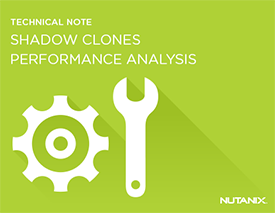 The result of enabling Shadow Clones is lower latencies on reads for workloads such as VDI, Cloud and Dev/Test. Learn about the performance advantages for distributed multi-reader scenario such as VDI boot storm.